Dennis Eckersley here for Prell: "After throwing heat for nine innings with a ballcap on, my hair is a fright by the time I reach the locker room. But no matter how much sweat, dirt and pine tar ends up in my locks, I know that Prell will hit a home run every time. Prell gives my hair the luster and full-bodiedness I need, whether I'm heading out for an evening on the town or just putting it up in curlers for the night. Prell also keeps my mustache looking full, soft and radiant, even after weeks on the road. Just ask my ex-wife. [Eckersley grows agitated] Sure, she left me for a teammate two years ago, but I bet that heartless wench still misses running her hands through my shining mane and lip warmer. Tramp! [Ten-second pause as Eckersley fumes] Just trust me, OK? 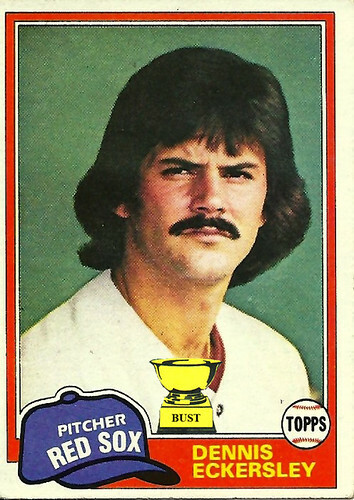 Even against Dennis Eckersley, Prell never strikes out." He looks like Valerie Bertinelli with a mustache.